This guide explains how to add an age verification splash page to your Jimdo website. It has been created by a Jimdo User for other Jimdo Users. It is not affiliated with the company Jimdo. The creation of an age verification with this guide is at your own risk - you are responsible for any errors that may occur. Keep in mind that every person on the Internet can access your Jimdo Website - that means also minors. When does an age verification really make sense? Generally if you sell alcohol/tobacco products or publish adult content (pictures, videos and text) you should implement an age verification. Reminder: This page is not an alternative for legal advisory. If you are uncertain about the laws in your country please consult a lawyer. Jimdo has a function to add your own HTML and CSS code, but does not support code that was added by the user. In case something shouldn’t work out the way it was intended the support won't be able to help you. Regarding this you should be especially careful. If something doesn’t work out and you are not able to access your site anymore. Open your page in safe mode. In safe mode external code will be ignored. This way you can access your page again. Create a new hidden subpage. On this page add a download-element. Afterwards open your new hidden subpage in the visitor view. 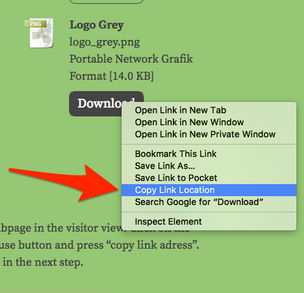 Click on the download button with your right mouse button and press “copy link adress” or "copy link location". 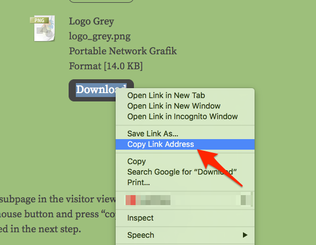 This is the link you are going to need in the next step. Open your Jimdo Page in Edit Mode and create a “Widget/HTML” element in the sidebar of your Jimdo Page. In the Widget/HTML element, insert the following HTML code. You can exchange the red parts with your own text or picture, if you wish to do so. Insert this CSS Code in the head of your Jimdo Page. If you are familiar with HTML and CSS feel free to adjust colors, font and alignment. Please make sure that you did everything accordingly and that you didn’t make any mistakes. Afterwards open your Jimdo Page and test if the process was successful. If it doesn’t work the way it should, you should check if you pasted the code correctly. In case you are unable to open your page, open it in safe mode and start over.